Baumann Consulting provided fundamental and enhanced commissioning services for the tenant fit out of CBRE’s new Chicago office headquarters certified under the LEED Commercial Interiors rating system at the Gold level. CBRE’s new downtown Chicago headquarters utilizes an open concept design across two floors. The space offers low panel workstations, interior enclosed offices, conference rooms, pantry areas, and technology rooms for basic office functions. Baumann identified and resolved issues with fan terminal units such as rattling, uninstalled temperature sensors, and room thermostats requiring rewiring. These could not have been determined through a standard inspection. Baumann identified these items by running the system through various temperature scenarios. Without commissioning, the tenant likely would have been unable to identify the cause of the thermal variations, experiencing temperature swings and discomfort indefinitely. 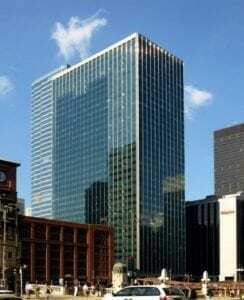 [:de]CBRE’s new downtown Chicago headquarters utilizes an open concept design across two floors. The space offers low panel workstations, interior enclosed offices, conference rooms, pantry areas, and technology rooms for basic office functions.